With just 10 days to go before snap elections, party leaders were put on the spot Wednesday in the first televised debate since 2009, though the prospects for alliances after the polls remained unclear. Apart from former prime minister and SYRIZA leader Alexis Tsipras and his key rival Evangelos Meimarakis of conservative New Democracy, the debate also involved PASOK leader Fofi Gennimata, Potami’s Stavros Theodorakis, Communist Party leader Dimitris Koutsoumbas, Popular Unity chief Panayiotis Lafazanis and Independent Greeks head Panos Kammenos. The leader of neofascist Golden Dawn, Nikos Michaloliakos, was not present. Tsipras grasped the opportunity to underline that the agreement his government signed with creditors in July managed to secure crucial rescue funding and to “stabilize” the economy. He conceded that “on the road, there were excesses and mistakes.” However, he insisted that SYRIZA negotiated, unlike ND, which he indicated merely gave in to creditors’ demands. Questioned about the hugely unpopular unified property tax (ENFIA), which he had promised to abolish and called on Greeks not to pay when he was in opposition, Tsipras insisted that it is a “ridiculous” levy and will be abolished. He avoided a reporter’s question about whether he himself has paid his ENFIA. Meimarakis hit back at Tsipras, claiming that ND had been more honest with Greeks and had not made promises it knew it could not keep. “We didn’t make promises to tear up the memorandum in one article,” he said. He also accused SYRIZA of wrecking the fragile recovery that that the ND coalition had achieved. “In January, when we handed over the country, the economy was in a much better state than it is now,” Meimarakis said. “The government of New Democracy was violently interrupted,” he said. ND and SYRIZA are polling neck and neck in opinion polls and Meimarakis’s popularity has grown to rival that of Tsipras. But the former premier has insisted that SYRIZA cannot share power with ND. Theodorakis said the support of his party could not be taken for granted. “We voted for the memorandum of Tsipras as the alternative was worse,” he said. “But that doesn’t mean we’re not going to defend the losers of the memorandum,” he said, referring to the unemployed and businesses forced to close. He emphasized the need for a review of the public sector, saying statist practices must be ended. Lafazanis defended his party’s stance in favor of the national currency, saying that a potential Greek exit from the euro has not been debated. “Austerity is the disaster,” he said, not Grexit. Returning to a national currency would boost exports, he said. Kammenos, for his part, said the biggest failure of the previous government, in which his party was junior partner, was not scrapping the ENFIA tax. He also underlined the importance of a stable tax framework being established to secure investments. 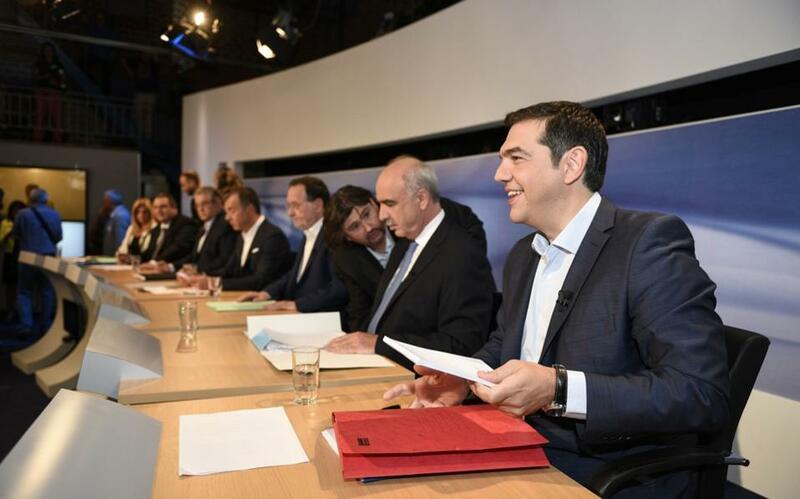 Another debate is scheduled for Monday and will involve just Tsipras and Meimarakis. In the meantime, campaigning is expected to heat up, with leaders planning speeches across the country. The parties finalized their candidate lists yesterday. There were no surprises on the list of SYRIZA, whose candidates include former deputy premier Yannis Dragasakis and ex-interior minister Nikos Voutsis, nor on that of ND, whose candidates include prominent deputies Theodoros Fortsakis and Dimitris Stamatis. Popular Unity secured the support of veteran leftist Manolis Glezos, PASOK that of party stalwart Costas Laliotis, while Potami will have prominent constitutional lawyer Nikos Alivizatos on its ticket.